Zhostovo patterns as an inspiration for Valentino and Dolce & Gabbana. Traditional Russian fashion elements are featured quite overtly by many current designers. / Valentino's Fall-Winter 2013-2014 Ready-to-Wear collection. We’re not just talking about a red headscarf with bright flowers. There are many traditional Russian patterns and Zhostovo painting is one of them. / Dolce & Gabbana women's Spring-Summer 2014 collection. The famous Zhostovo pattern is usually painted on a black background, but rarely on red, blue, green or silver. Its main motif is a bouquet of flowers where larger cultivated specimens alternate with small wild florets. / Dolce & Gabbana women's Fall-Winter 2012-13 collection. This motif can be found on the catwalks of Dolce & Gabbana, Valentino and Dries van Noten. / Valentino's Fall-Winter 2013-2014 Ready-to-Wear collection. RBTH features a video about how Zhostovo trays are designed and painted according to centuries-old traditions. Not all flowers look the same, but some refer to Russian folkloric design elements. 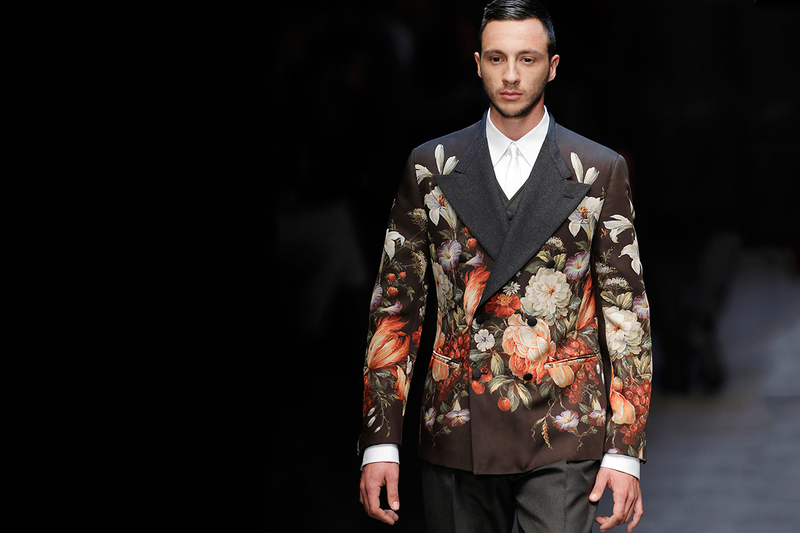 / Dolce & Gabbana men's Fall-Winter 2013-14 collection. It’s an applied inspiration – from traditional Russian crafts to modern designs. / Dries van Noten Spring-Summer 2014 men's collection. Dries van Noten's Spring/Summer 2014 Ready-to-Wear collection. Dries van Noten Spring/Summer 2014 Ready-to-Wear collection. Valentino's Fall-Winter 2013 Ready-to-Wear collection.